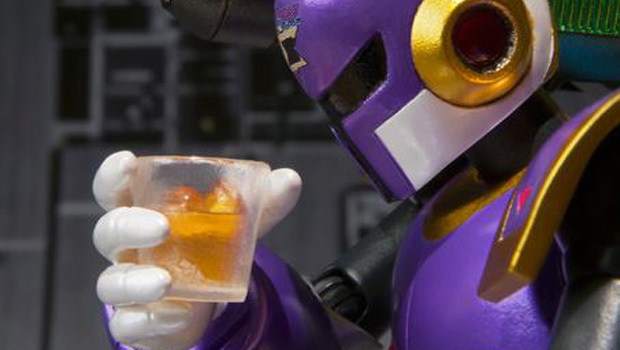 The next figure in Bandai's D-Arts Mega Man X figure line is X's longstanding rival Vile. As you can see in the photo above, the figure includes a glass-filled-with-hard-liquor accessory. Insta-buy! Confirmed for US release by Bandai's American distributor Bluefin, Vile arrives hot on the heels of the recent Zero Type 2. When he's not pounding down bottle after bottle of Jack Daniel's, Vile is taking care of business with his shoulder-mounted cannon and knee gun. Oh, did I mention that his knee transforms into a gun? DOUBLE insta-buy! No pricing or release date has been announced yet, but you'd have to be a huge hater to pass up on what may be the most awesome action figure of the year.